CBC K-W sent surveys to the candidates for mayor in Waterloo. These are their responses to our questions. We asked the candidates for mayor in Waterloo to answer a survey where they all were presented with the same questions. There are three people running to be mayor of Waterloo including incumbent Dave Jaworsky, Chris Kolednik and Kelly Steiss. 1. What is the number one issue you think Waterloo is facing and how would you address it? Getting around the city is a subject that comes up over and over again as I speak to residents. My vision is that you should be able to get around our community with any form of transportation, safely. This issue covers all forms of transportation and a number of different community concerns. Whenever the city starts a road project, we aim for "complete streets." Road improvements should be designed to safely handle all types of traffic, including cars, trucks, buses, cyclists and pedestrians. The main goal is to make our streets and sidewalks safe so it's easy to get around the city of Waterloo, no matter what mode of transportation you choose. The vision places a priority on vulnerable users, cyclists and pedestrians, by installing missing sidewalks, multi-use trails, and protected cycling infrastructure and bike lanes, where possible. We've done a lot of work over the last term to improve infrastructure and put preparations in place for the ION. We've improved the streetscape in uptown Waterloo to make wider sidewalks for pedestrians. The new segregated cycling lanes will also have "protected intersections" defined by green paint treatment, which will be a first in the region. 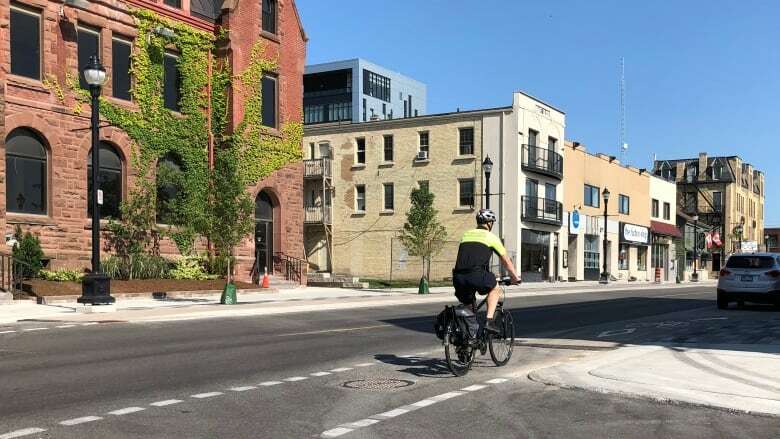 Recently, the Share the Road Cycling Coalition awarded the City of Waterloo their Bike Friendly gold status, only the third community to do so. No community has achieved the next level, platinum, so our target is to be first. As the west side continues to build out, in 2019 we will start the extension of Columbia Street south to Erb Street beyond Costco to ease congestion at the Ira Needles roundabout. Erb Street, west of Fischer-Hallman will also be widened to be better for vehicles, and safe for cyclists and pedestrians. Better Infrastructure. We've already made a start, but we need to accomplish more, through a new long-term financial plan, targeted for 2020. Two years ago, city staff created an award-winning asset management system that predicts the future of each city asset. This system allows us understand areas that need addressing and prioritize, based on need and cost. It allows us to test different funding scenarios, so we can get the most for our infrastructure investments. Our stormwater management system is one area we identified as having a high level of need. This information helped us secure $4 million in grant funding from the federal and provincial governments. These upgrades were completed this year and have dramatically increased our flood prevention capability and resilience to climate change. Other examples include replacing streetlights with LED lights, which will save the city around $400,000 per year. We've also retrofitted city buildings with LED lighting, which is expected to help us save another $400,000 per year. This money can be redirected into other infrastructure projects. While old infrastructure needs to be repaired, we also need to respond with new facilities, because we are a growing community. In 2019, we will start construction of a new east-side library at RIM Park. Also, the number of seniors in Waterloo will double in the next 15 years. We will respond to those needs with a new older adult recreation centre in 2020, along with expanded facilities for all at the Rec Complex. We have the tools in place to help us tackle long term financial planning to improve our community infrastructure. I plan to use the information now available to us, along with my experience and expertise in government relations to work with the federal and provincial governments to secure as much funding as possible. While I have a vision for a new state-of-the-art comprehensive hospital longer term, homelessness and affordable housing, alongside the opioid crisis, are the pressing issues today. Solving these challenges involves different levels of government. At the regional level, we've just released a plan to end chronic homelessness. Next term, we will develop a housing master plan to guide us to the future. Notably, much of the funding needed comes from the provincial level of government. The new federal poverty reduction strategy also shows much promise. I see my role as being a hands-on advocate working to secure more funding. In the city of Waterloo, land value is rising. At the same time, land is not readily available because we are at our borders. We made the responsible and environmentally wise choice to stop sprawling onto farmland and to protect the Waterloo moraine. These are good decisions, which means we have to be innovative in our choices. I'm pleased with the progress I've seen in the city. At the city level, we've supported housing-first projects by funding the family housing YWCA on Lincoln Road and the Supportive Housing of Waterloo (SHOW) site on Erb Street. The province has just approved inclusionary zoning regulations that will give us a tool to require developers to include affordable units in future developments. My plan is to build on the progress we've made by pursuing this avenue as a way of increasing our supply of affordable housing. We're fortunate to be a city that enjoys prosperity, and residents want to see programs that contribute to social good. My goal is to work with the different levels of government and the agencies that work hard in our community to eliminate poverty and find new solutions to increase the availability of affordable housing. 4. How would you co-ordinate and communicate with the Ontario government about the needs of residents in Waterloo? The first step is to always work with our local MPPs. I will always be an advocate for the City of Waterloo and will continue to forge relationships and work closely with our provincial and federal representatives. We are fortunate to be the only city hall in Canada with all levels of government in one place, as MP Bardish Chagger and MPP Catherine Fife have their offices just steps away from my office. The best way for the province to understand the needs of the residents is invite the premier and ministers to visit the city so they can see what we're doing here for themselves. Waterloo is a city on the rise and a jewel in the province. With the college and universities, we are an important talent-generator for the province. There is another way we can build vibrancy in the city. No one knows the needs of the residents better than the non-profit groups that serve our local residents. Before becoming mayor of Waterloo, I worked for Capacity Canada. Our mission was to bring together the people and the organizations that could drive social change. I plan to work with our non-profit sector to help them build their capacity to ensure they are able to develop sustainable funding, and attract new volunteers, so they are able to meet the needs of the residents they serve. I moved to Waterloo in 1983 to do my math degree at the University of Waterloo. I fell in love with the city. I've been a passionate supporter of the area for many years. Before I became mayor in 2014, I served the community through volunteerism. From board roles with the K-W Chamber of Commerce and Communitech, to working with vital non-profit groups like Kidsability and the K-W Community Foundation, I had the opportunity to listen and understand the issues affecting our residents. At BlackBerry, I created the global corporate social responsibility team, ensuring BlackBerry was viewed as an upstanding corporate citizen. Jan and I have two grown sons, and will celebrate our 29th wedding anniversary the day before the election! I ran for mayor in 2014 because I wanted to deepen my contributions to the city. Since then, I have served on several citizen-led committees, including Age Friendly Waterloo, the Waterloo Economic Development Committee, and the Audit Committee. I am also a councillor for the Region of Waterloo. As a member of the Waterloo Region Municipal Resettlement Control Group, I helped guide the large-scale refugee resettlement, which welcomed over 1,000 newcomers to the community. The City of Waterloo has emerged as one of the most vibrant and innovative communities in Canada. Our business sector is booming, our employment growth is strong, our property taxes are competitive, and our neighbourhood associations are better funded and more inclusive than ever before. I am eager to continue building on my platform of positive leadership so we can reach even higher as a community. It has been an honour and a pleasure to serve as the City of Waterloo's mayor for the last four years. I'm proud of what we've been able to achieve, and I'm excited about our future. Right now the number one issue facing Waterloo and its citizens are the careless spending habits of council and the mayor. After door knocking close to 4,000 doors already, and listening to the cries of help from so many people, many in the area are stating directly to me that life has simply become unaffordable in Waterloo and the region. I had an older lady in near tears at the door saying she didn't think she could afford her home anymore because her pension is barely covering her basic necessities. We need to curb spending at the city and regional level. I'm running on a fiscally prudent platform. I'm the only one advocating to reduce my city salary by 10% when I'm elected. Leadership starts at the top, and frankly we haven't had any leadership the past four years. What's seriously troubling is that we have a mayor who accepted a salary increase during the LRT construction phase in uptown Waterloo and then the streetscape construction which came after that. Many of these business owners lost between 20 per cent to 50 per cent of their total earnings. It shows a serious character flaw and a lack of empathy for our uptown business community who provide so many jobs to the community and a place where one can go to have fun and relax. As a community and as a council, we need to prioritize what's important to the people of Waterloo to face this challenge together, and I want to work with the next term of council to address this serious and pressing concern. Lastly, if there's one thing to remember when going to the ballot box, this past council had the biggest tax-and-fee increase of the past three council terms. As a city, and even at the regional level, we're not doing enough for our seniors. Many seniors in Waterloo are being hit the hardest by the cost of living increases and are seeing the effects of crippling and suffocating tax increases at the city level. My former neighbour, who I lived beside for nearly a decade, was a lady in her 70s who is on a fixed monthly income. When taxes go up, along with the cost of living, seniors, along with my former neighbour, have to adjust how they live in terms of what groceries to purchase, what basic necessities they deem crucial to them, and so on. Moreover, most seniors with whom I've spoken to, or those retired, prefer to stay in their homes as long as possible, because they know most retirement homes are aggressively overpriced as well. As a city we're overlooking our senior citizens, who not only built our community, but built our province, and country as well. We need focus on our seniors just as much as everything else that is crucial to building our community. When elected mayor, one of my commitments will be dedicated to the seniors of our community. Actively listening to our seniors and seeing what they need will be crucial to our community as a whole. As demographics change and the Baby Boomer generation gets older new challenges will be faced. This is why I intend to make seniors and those retired to be part of an active continual discussion with the city so we can learn on how to faces these challenges together. There's a multitude of issues that need to be addressed now, and the next four years. That being said, Waterloo is an undoubtedly a growing community. I grew up in Colonial Acres where I still remember corn fields located at Conestoga Mall and soccer fields where I used to play as a kid. One of the biggest challenges will be addressing intensification within the core, which we're already seeing now, and the intensification into residential suburbs, which the new comprehensive zoning by-law if and when passed, will allow developers to come into suburbs and build large condo complexes beside homes, which doesn't make any sense. These communities feel they are being uprooted, and have no voice at council after living in the neighbourhood for 20, 30, 40-plus years. People need to realize, it would be like dropping an industrial building into a residential neighbourhood. There's no vision at the city. I'm the only mayoral candidate with any real estate background and knowledge of zoning. I don't need to rely on city staff for an understanding for what's happening and going to take place. I'm the only one with any vision in that regard. Look at the proposed Beechwood development condo as an example. The official plan allows for a project like this to be built, but it sticks out like a sore thumb. It's not something I would approve as mayor, especially in an established neighbourhood like Beechwood. Striking a delicate balance between where intensification takes place and having a community that feels its city is still looking after them and listening to their concerns is very important. I'm not here to sell out the community for taxation dollars, which is what seems to be happening. Intensification needs to happen but it has to happen in incremental steps, not overnight. Overall I believe we have fantastic representation from our local representatives fighting on behalf of the residents of Waterloo at the provincial level. However, as a municipality and as a region, we have to come together to voice our concerns for the residents of Waterloo and the region. One of the ways is through continual dialogue through our local representatives who have a direct voice at Queen's Park, and through engagement with our provincial leaders. Many in the region are advocating for high speed rail which will be needed at some point to get people moving but more importantly bring people and new ideas into the area for economic and job growth. We have to show the current Ontario government that Waterloo and the region is a great area to live, work, and play, but continual dialogue, and invitations to the city and region are needed to always be on Ontario government's radar. I think people should know I grew up in a fairly normal middle class life. My parents came to Canada in the 1970s with essentially nothing and met here while working at Weston Bakeries. Both my parents fled communism at different times and from different countries. My mom's of Polish descent, while my dad is Slovenian, which is part of the former Yugoslavia. I'm grateful for what they have accomplished and have done for me and my sister. They've always instilled the notion of working hard, while always lecturing me do any job right the first time without cutting corners. I think to many people today have a victimhood mentality, where if they can't accomplish a certain task, they want to blame it on someone else besides themselves. There's not enough ownership today of one's life. Certain political parties certainly cater to this type of thinking, which is sad really. We live in the greatest country in the world, and even though we face certain issues as a country, there's still a tremendous opportunity in this country to be free, start a business, raise a family, and do other things that many can't in other parts of the world. Likewise, too many of our politicians today are more more concerned about taking selfies and posting pictures of their socks online, while I'm concerned about tackling the meaningful and substantive issues affecting people's everyday lives. I want to bring this entrepreneurial spirit to City Hall, while being fiscally prudent, giving people options, easing their cost of living expenses, and bringing back common sense to the table where it deservedly belongs. In March of this year, council floated the idea of a 6% tax increase. This is the council who, in their first few months in 2014, ignored the laws governing public meetings and manipulated the system to hold private budget meetings out of the public eye. The Ontario Ombudsman had to step in and stop it, embarrassing. In addition, over the past two years, the number of city staff earning over $100,000 has almost doubled. What we have seen is poor leadership and poor management of our tax dollars. As household debt increases, we need to be even more mindful of how we plan and spend our taxpayer's dollars. Under my leadership, there will be a well-managed budget that plans for the future, that responds and is ready for future growth that reflects taxpayer priorities. Under my leadership, our budget will involve the taxpayers and we will ensure our budget is transparent – our community will have involvement in and access to the budget. A budget that is easily understood. From business to resident, from our students to our seniors, people have been telling me that they feel that they haven't been heard. They feel that they are not getting access to plans that involve them or their neighbourhood, that information is difficult to access, that information seems to change without consultation or understanding and that there isn't follow-up. Our people are our best asset. Residents share that they feel disconnected from our current leadership in council. People need to feel that their voice matters and that they have been heard. Under my leadership, resident engagement will be increased with quarterly "Connect with Kelly" sessions where everyone will be able to connect with me in-person, on the phone or via social media. I will listen, engage and show-up. We need logical, sustained and relevant investment in our infrastructure. Love it or hate it, we have the LRT. Our city and our region has already invested a great deal of money in this infrastructure. To ensure that we make the most of our investment, we need to create hubs around all of our LRT stops that will promote ridership, neighbourhood engagement and jobs. I have also heard that people are finding it increasingly difficult to be able to afford to live in Waterloo. We need to address housing to ensure that it is affordable, accessible and that offers a diversity of options. We currently have development that is disconnected, disorganized and is a frantic compilation of buildings. We need neighbourhoods with identity, smart growth and an integrated and clear vision. And, a forward-thinking and inclusive city promotes active transportation that is safe, connected and one that provides options for travel throughout our city. There are solutions to these challenges but we need a strong mayor with experience, vision, passion and the desire to address these challenges. Waterloo needs a strong mayor. Someone who is prepared to step forward and be present. Over the last four years our current mayor has been missing. [In August there] has been hosted by AMO (the Association of Municipalities of Ontario) where there were opportunities to meet with the new provincial government and the Minister of Municipal Affairs and our current mayor chose not to go. Whether you agree with the direction of the [Premier Doug] Ford government or not, this is an important opportunity not to be missed. Our mayor needs to represent us at all times and in all opportunities. With the Ford government looking at things like municipal reform and transportation, it is important to participate in those dialogues. This is not a time to be absent but to be out in front. It is about seeing ourselves as partners with and within the province. Under my leadership Waterloo will have a strong mayor — one who will advocate for the needs of residents and business at all levels of government; a mayor who is present year-round and a mayor who is at the table during key and important discussions. I have long and strong ties to Waterloo. My family settled here and became successful merchants running the Kuntz Brewery. My grandmother was born and raised in Waterloo. I graduated from the University of Waterloo and Renison College. And my husband and I chose to raise our family here. I also bring more than 16 years of municipal government experience. From site plans to budgets, from strategic planning to service delivery, I have sat at those tables, participated and been a part of the leadership team. I know what goes on, the questions that need to be asked and the leadership that is required. I know that Waterloo can be better.